Our next review comes from a game by Pixel Toys. If you recall, we had an interview with Andy Wafer of the new studio. Their first Nintendo 3DS project is a platformer where you play as Mr. Nibbles, collecting acorns to feed his family. It's Super Little Acorns 3D Turbo. While the name isn't the easiest to slip out of your mouth or roll of the tongue, the game is actually a pretty decent amount of fun. For details on why, here's our review. In the past, Nintendo has had some very strict and stringent policies towards downloadable games and the developers who make them. We've heard horror stories about studios not being paid until they reached a certain amount of sales on WiiWare. Thankfully, now Nintendo has stepped up their game and loosened their grip. We see this now with both the Wii U eShop and Nintendo 3DS eShop. The latter has a new game by a relatively new studio named Pixel Toys. 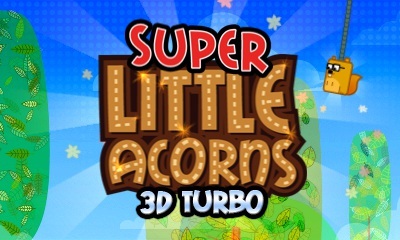 The studio has come out with a game with a mouthful of a name, Super Little Acorns 3D Turbo. Will this game make you go nuts in the good way or the bad way? What is a squirrel to do when his acorns are stolen and he has a family to feed? Well, if you're Mr. Nibbles, you hunker down and prepare yourself to get all of your acorns back through a myriad of increasingly more challenging levels. Super Little Acorns 3D Turbo is split up between three years. Each year has twenty levels inside. Every fifth level has Mr. Nibbles not only nabbing acorns but he also has to round up little babies that scurry around the levels too. The final level of each year pits Senor Nibbles against a boss who he must race to the finish. As Mr. Nibbles gains more and more acorns, an end of level gauge fills. As it crosses certain milestones, new things are unlocked such as new modes and new years to play. to the goal in time to clear each level. 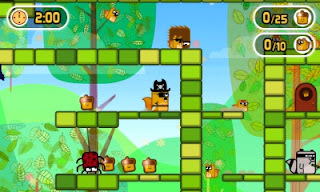 Every level in Super Little Acorns 3D Turbo has its own set of tasks for Mr. Nibbles to accomplish. The standard goal is to collect all of the acorns in a given level within the time limit and reach the goal. However, completionists will have a field day with this game, as there is really A LOT to do. For instance, there's beating the level's time trial, defeating all enemies, and collecting all fruit. The latter of these tasks unlocks a new costume piece for Mr. Nibbles, such as an afro, a tuxedo, and new kinds of ropes. Hey, even squirrels have to represent now and then. 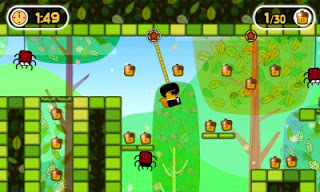 Levels in general are well designed, but a lot of them share the same obstacles, enemies, music, backgrounds, and hazards, so things can look rather repetitive quite often. That said, each level is set up to challenge the player in different ways, from platforms that move to ones that collapse once stepped on. There are also places in levels where Mr. Nibbles can swing off of, which makes crossing gaps a fun excursion. Mr. Nibbles has certainly gotten the swing of things. To assist Mr. Nibbles in his acorn and baby collecting, there are three types of power-ups that appear in a lot of the levels. Speed is pretty much obvious as what it does, giving Mr. Nibbles a shot in the arm (or is it feet?) so he can move faster. Invincibility makes charging through otherwise impervious foes an ability, as well as smashing through walls that would at any other time be impenetrable. Finally, the high jump allows Mr. Nibbles to reach for the stars... or at least get closer to reaching them. Although all of these power-ups only last for a limited amount of time before they wear off, they are extremely helpful nonetheless. 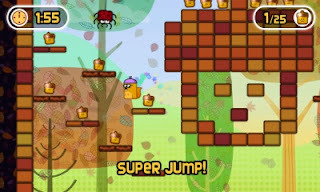 Jump higher with the Super Jump power-up. Outside of the regular mode that is full of replay value, there are two other modes making the game even MORE full of content. First off, there's Challenge Mode that consists of ten challenges based off of different concepts like long jumps or swinging, for instance, and each of the challenges has three difficulties to earn medals in. Not only is there Challenge Mode, but there's also something called Turbo Mode. 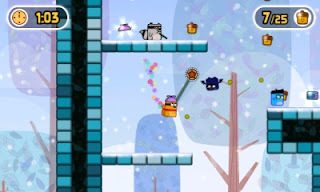 This is a more difficult version of the regular mode the game possesses, offering even more content. It bears repeating that for a game this cheap in price, Super Little Acorns 3D Turbo is absolutely packed with content. Challenge Mode is a serious... well... challenge! When Mr. Nibbles takes damage, he gets poisoned for a temporary amount of time. In this form he cannot move as nimbly or jump as high. Perhaps my only issue with the actual platforming in Super Little Acorns 3D Turbo is that the controls aren't as tight as I would have liked, leading to a lot of annoying hits and missed jumps. when you have warm costumes to wear? In way of presentation, Super Little Acorns 3D Turbo does its job rather well. The graphics are quaint and cute, and the 3D effect makes a clear distinction between the foreground, where the characters and platforms are; and the backgrounds of each level. The music is highly forgettable, but thankfully it is nothing grating. It's just there in all honesty. It doesn't get in the way, but it doesn't impress either. Super Little Acorns 3D Turbo has me excited about the six month old studio of Pixel Toys. The game makes me interested in what they're going to do next, regardless of whether they return to the Nintendo 3DS. Super Little Acorns 3D Turbo has plenty of charm, loads to unlock and do, and has accessible controls for beginners and experts alike to enjoy. The low price point is just the icing on the cake. If you're looking for a downloadable title on the Nintendo 3DS eShop that will give you plenty of bang for your buck, Super Little Acorns 3D Turbo is a perfect fit. Time to get nuts! Review copy provided by Pixel Toys.